This study aimed to quantitatively assess the ability of two single-step restorative materials to avoid crown darkening caused by the use of minocycline as an intracanal medicament. After coronal access and instrumentation, 120 maxillary incisors were divided into four groups (n = 30). Two experimental groups according to the restorative material applied to the inner walls of the access cavity: OB, OptiBond All-In-One + minocycline intracanal paste; U200, RelyX U200 + minocycline intracanal paste. Two control groups without restorative materials: MIN, minocycline intracanal paste and SL, saline intracanal. Color determination was performed using a spectrophotometer at five time points, immediately after materials were applied (baseline), and at 7, 14, 21, and 28 days from the baseline. Decrease in the mean values of L* (luminosity) was observed after insertion of minocycline paste in all groups at all time points. Statistically significant differences were absent between the time points (P > .05). After 28 days, MIN showed significantly more darkening (ΔL*) (− 10.6 ± 7.3) than OB (− 5.4 ± 6.2), U200 (− 5.8 ± 3.9) and SL (− 2.3 ± 1.2) (P < .05). Crown darkening can be minimized by the previous application of RelyX U200 or OptiBond All-In-One to the inner walls of the access cavity before a minocycline-containing paste is applied as an intracanal medication. 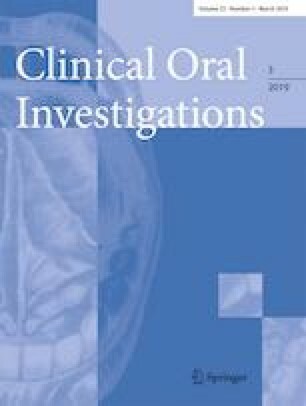 The American Association of Endodontists Clinical Considerations for Regenerative Procedures in necrotic immature teeth suggests the triple antibiotic paste as an intracanal medication (2018). However, discoloration and crown darkening are common unfavorable outcomes. The clinical protocol suggested in this paper has shown to be able to minimize crown darkening, predictably leading to a better patient-centered clinical success. The work was supported by the FAPERJ (Proc. E-26/202.839/2015). This study was approved by a panel from Pedro Ernesto University Hospital/Rio de Janeiro State University Ethical Committee (CAAE no. 24840413.8.0000.5259/CEP-HUPE).